SureStart™ Control Cabinet – Spectrum, Inc. The Spectrum SureStart™ Control Cabinet is a complete system that provides all necessary control features for our Flat-Jacket Snow Melters and Crib Heaters. Our standard product line offers 1–12 circuits in a single case so that you can control track switch heaters cost effectively. We use all commercial-off-the-shelf (COTS) components to make maintenance easy and affordable. Our engineers are also ready to collaborate with you to design the best possible custom solution when your requirements are outside of our standard product line. 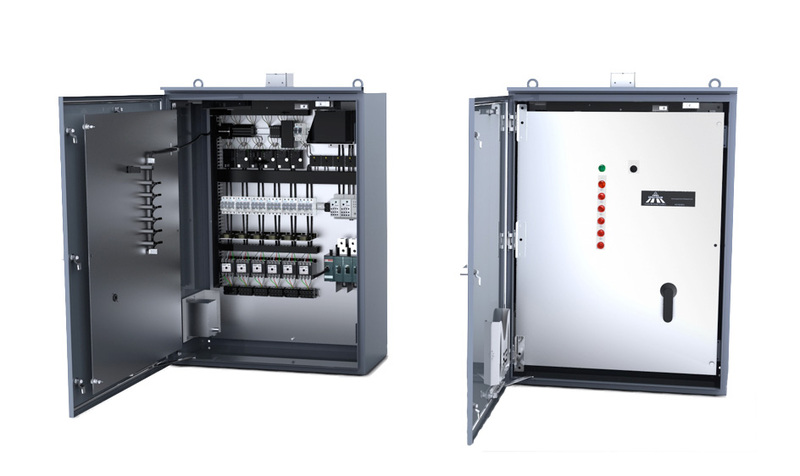 For 13+ circuits or a different size enclosure, we will work closely with you to design a system to meet your specific requirements and that will provide years of trouble-free operation. The Spectrum Snow Detection System utilizes temperature and moisture sensors with adjustable settings for automatic operation of track switch heaters. Available in 240, 480 and 600 AC Voltages. Operates Manually or Automatically with Snow Detection System. Includes remote customer connections and Signal System interface. Ground fault protection per circuit. Stagger Start delays the start-up time to reduce initial electrical inrush. Protected dead front inner panel. Safety/Service disconnect mounted on dead front door. 4-wire Configuration: separate circuit breaker for crib heaters and cal rods. Mounting legs for pad mount.